"Leading Families to Optimum Health & Function, Naturally!" Neurological Health– chiropractic care improves the connection between the brain and body, restoring proper nerve signals and improving organ/muscle function. Nutrition/Supplementation– this is the fuel and energy necessary for life, the key is decreasing toxicity in your body and addressing deficiencies in your diet. Regular Exercise– some form of physical activity that gets you moving. Benefits are endless from anti-aging to bone and cardiovascular health. Adequate Rest– it is a well-known fact that during sleep and relaxation our body restores and repairs itself best. We sleep about 1/3 of our lives for good reason. Mental/Spiritual Health– create positive mood and energy for the power of the mind is limitless. Surround yourself with the right people, manage stress, believe and have faith. Although there are a few variations on the 5 Pillars of Health, they are ALL based on 1 key principle…BALANCE! 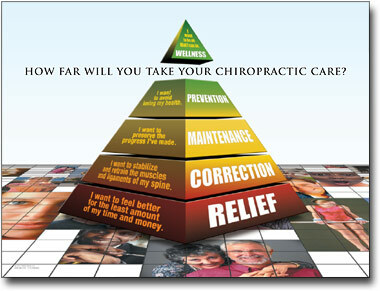 How Far Will You Take Your Chiropractic Care? Health is a Journey…Are you on your way to the top? Whether you want Relief of your pain/symptoms, Correction of the Cause of your pain/symptoms, Maintenance of health, Prevention of disease or Lifetime Wellness, Chiropractic Care can make a significant difference in your life. Join the Wellness Revolution and make a Chiropractor part of Your Health Care Team today! Trapped in the current sick care system? Click to subscribe to this blog and receive Free Health & Wellness news posts by email. We will NEVER send more than 1 e-mail per week.